As #1 "New York Times" bestselling author Kelley Armstrong s new Cainsville series continues, Olivia s power to read omens leads to the discovery of a gruesome crime with troubling connections to her new hometown. "Omens," the first installment in Kelley Armstrong s exciting new series, introduced Olivia Taylor-Jones, daughter of notorious serial killers, and Gabriel Walsh, the self-serving, morally ambiguous lawyer who became her unlikely ally. Together, they chased down a devious killer and partially cleared her parents of their horrifying crimes. Their success, however, is short-lived. While Olivia takes refuge in the old, secluded town of Cainsville, Gabriel s past mistakes have come to light, creating a rift between the pair just when she needs his help the most. Olivia finds a dead woman in her car, dressed to look like her, but the body vanishes before anyone else sees it. Olivia s convinced it s another omen, a sign of impending danger. But then she learns that a troubled young woman went missing just days ago the same woman Olivia found dead in her car. Someone has gone to great lengths to kill and leave this young woman as a warning. But why? And what role has her new home played in this disturbing murder? Olivia s effort to uncover the truth places her in the crosshairs of old and powerful forces, forces that have their own agenda, and closely guarded secrets they don t want revealed." "[The] chilling ending leaves just enough unresolved to hook readers for the next installment." 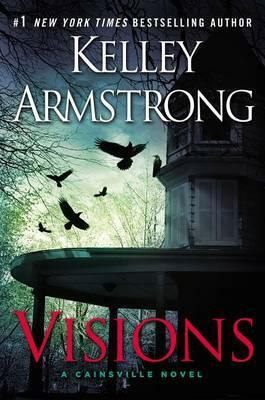 - "Publishers Weekly"
PRAISE FOR KELLEY ARMSTRONG'S "OMENS"
"One of the best new series debuts this year! With its compelling characters and completely original set up, OMENS delivers a powerful combination of suspenseful thrills and supernatural chills. I can't wait to read more!" -Lisa Gardner, "New York Times" bestselling author of "Touch & Go"
"Like the creepy, spooky town of Cainsville, Kelley Armstrong's OMENS lured me in. I was too busy, way too busy for this book, which, through a series of surprises and sleights of hand, had me conspiring for ways to get back to the gripping story, the colorfully bizarre cast of characters, and the clever, strong, smart heroine at its center. Don't pick this book up if you have anything else to do. It will grab you by the collar and won't let you up for air until it's good and ready. And once you're done, you won't soon forget it." -Lisa Unger, "New York Times" bestselling author of "In the Blood"
"Cainsville might be a nice place to visit, but I'm too creeped out to live there. Luckily, Armstrong isn't, and her dispatches from this village filled with sinister secrets are going to be keeping her readers up well into the night." "Urban fantasy powerhouse Armstrong (the Otherworld series) begins the Cainsville series with a gripping thriller-paced novel featuring a young woman who learns that her wealthy parents adopted her after her biological parents were convicted of being serial killers. Mind control, gunplay, and double crosses will keep readers on edge to the last page." "Through first class writing and characters--including the town of Cainsville itself--that leap off the pages, Armstrong has penned a tale that I, for one, can't wait to see continue." "Armstrong, author of the popular Otherworld series, excels at world-building, and this 'reverse Cinderella story' perfectly launches a new series chronicling the irresistibly odd and creepy Cainsville universe. Fantasy fans will be eager to make repeated visits." KELLEY ARMSTRONG is the #1 "New York Times" bestselling author of the Otherworld series, as well as the young adult Darkest Powers and Darkness Rising trilogies and the Nadia Stafford series. She lives in Ontario, Canada.